I came across this gem of a picture and love that it shows what I love best about my kids. It's not particularly pretty or creative, it's not even in focus! But it shows Josh having to challenge himself to get up with no hands, Lizzy dreaming some kind of imagination into reality, and Matt doing the scariest thing he possibly can in that moment. 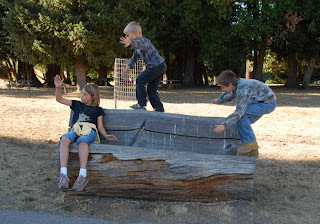 It's a bench cut from a log, but it's also an obstacle, a throne, and a tight rope. I love walking with them, wherever we are, and watching them together. They may play the same game or they may be in three separate worlds, but they're together. That's what I love best. Great pic, and sweet post! Thanks for the inspiration.